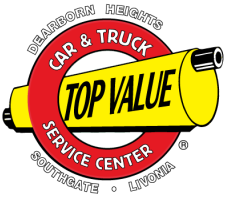 Thank you for choosing your local Top Value Auto Repair Shop to service your vehicle. We offer complete service and repair for passenger cars, trucks, vans, RV's, commercial/fleet cars, trucks and vans. Your time is valuable, that's why we offer Same Day Service on most repairs, a comfortable waiting room (coffee on us!) and an off-hours drop box, which allows you to drop your vehicle off 24 hours a day. We accept checks, all major credit cards, and corporate / fleet charge accounts. Please call us or just stop by.